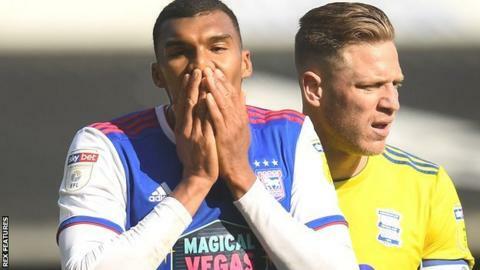 Ipswich Town boss Paul Lambert said the club's relegation is "gut-wrenching for everybody" after their drop to League One was confirmed. "The support is unbelievable, I'm gutted for them, I'm gutted for the players and I'm gutted for all the staff here at Portman Road. "I've always believed [we could stay up], everyone who knows me knows I'm a realist but I'd always believed we could do well. You've got to analyse the disappointment and then try to plan what will happen next year. "It's gut-wrenching, it's horrible. But we have great things to look forward to." It has been a dire campaign for the Suffolk side, who sacked boss Paul Hurst after just one league win from his 14 games in charge. Replacement Lambert proved unable to turn the club's fortunes around and admitted before Saturday's game that relegation to the third tier, for the first time since 1957, had been hanging over the club's head "for months". The hosts went into the game knowing that anything less than a win would see their 17-year stay in the second tier come to an end, but they fell behind after just seven minutes when Lukas Jutkiewicz hammered home from close range. Gwion Edwards levelled for Ipswich straight after the break before Alan Judge hit the post for the home side, with the draw keeping Birmingham six points above the bottom three. Relegation means Ipswich will face Lincoln City in a league game for the first time since 1961 next season after the Imps secured promotion from League Two on Saturday with a 1-1 draw against Cheltenham Town. "Commiserations to Ipswich as a football club. It's a tough day for them. They came out fighting and gave everything. "We had the chances to win the game. Even in the second half we had three really good chances and we didn't take them. "You can't afford to do that if you want to take the three points. We weren't clinical enough today." Match ends, Ipswich Town 1, Birmingham City 1. Second Half ends, Ipswich Town 1, Birmingham City 1. Attempt blocked. Gwion Edwards (Ipswich Town) right footed shot from the right side of the box is blocked. Substitution, Birmingham City. Jacques Maghoma replaces Kerim Mrabti. Offside, Ipswich Town. Kayden Jackson tries a through ball, but Collin Quaner is caught offside. Corner, Ipswich Town. Conceded by Connor Mahoney. Attempt blocked. Myles Kenlock (Ipswich Town) right footed shot from the left side of the box is blocked. Attempt saved. Alan Judge (Ipswich Town) right footed shot from the centre of the box is saved in the top left corner. Assisted by Kayden Jackson. Attempt blocked. Gwion Edwards (Ipswich Town) right footed shot from outside the box is blocked. Assisted by Cole Skuse. Aristote Nsiala (Ipswich Town) is shown the yellow card for a bad foul. Gwion Edwards (Ipswich Town) wins a free kick on the right wing. Foul by Myles Kenlock (Ipswich Town). Attempt missed. Lukas Jutkiewicz (Birmingham City) header from the centre of the box is too high. Assisted by Connor Mahoney with a cross following a corner. Corner, Birmingham City. Conceded by Myles Kenlock. Foul by Collin Quaner (Ipswich Town). Corner, Ipswich Town. Conceded by Harlee Dean. Attempt blocked. Alan Judge (Ipswich Town) right footed shot from outside the box is blocked. Joshua Emmanuel (Ipswich Town) wins a free kick in the defensive half. Corner, Ipswich Town. Conceded by David Davis. Cole Skuse (Ipswich Town) wins a free kick in the attacking half. Attempt missed. Lukas Jutkiewicz (Birmingham City) left footed shot from outside the box misses to the right. Assisted by Kerim Mrabti.